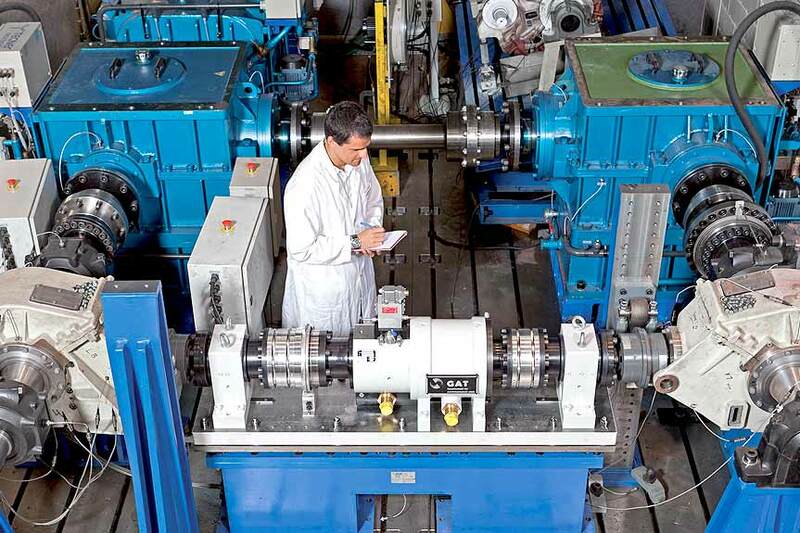 CETEST’s facilities include test benches for developing endurance and functional tests on gear boxes. Our test benches can be adapted to different powers, speeds and torques. We can therefore run any tailor-made testing solution adapted to our client’s needs. There is a sufficient amount of oil, which is needed to dissipate the heat generated during this kind of operation. Oil is distributed to all moving elements inside the gearbox (mainly the bearings and gear contact). Initial gearbox bearing and oil temperatures when operating at maximum speed. For external oil leaking out of labyrinths, seals, etc. Maximum gearbox design speed (for worn wheel). Simulation of nominal working conditions with a combination of speeds and torques equivalent (or higher) to those experienced by the gearbox during operation. The primary parameters checked during the test are bearing and oil temperatures, and vibrations and noise during torque transmission. A grease chemical analysis and bearing inspection are completed after the test.